Dry ice is the solid form of carbon dioxide. It is primarily used as a cooling agent. Its advantages include lower temperature than that of water ice and not leaving any residue (other than incidental frost from moisture in the atmosphere). It is useful for preserving frozen foods where mechanical cooling is unavailable. Dry ice sublimates at 194.65 K (-78.5* C; – 109.3* F), at Earth atmospheric pressures. This extreme cold makes the solid dangerous to handle without protection due to burns caused by freezing (frostbite). While generally not very toxic, the outgassing from it can cause hypercapnia (abnormally elevated carbon dioxide levels in the blood) due to buildup in confined locations. 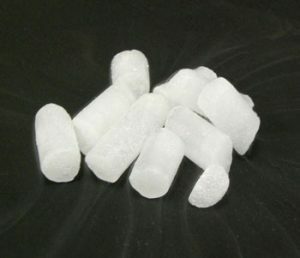 Dry Ice is sold in block form as a standard. If you need it in pellet size we can order that for you. Dry ice is perfect for every portable refrigeration needs in camping, hunting, boating, fishing or for chilling party food at home. It delivers more cold per pound and lasts longer than other portable refrigeration methods. To keep refrigerated or frozen food fresh and prevent spoilage, experienced outdoor enthusiasts turn to dry ice. Dry ice can be used for either freezing or cooling. Using the right amount for dry ice for your vented cooler will provide up to seven days of frozen portable refrigeration. To determine the amount of dry ice for the situation ask our experts. Place a small amount of dry ice in the bottom of your vented cooler, cover with wet ice cubes, and pack the cooler. Depending on the temperature outside, the hold time will be 4-5 days. (use 1 part dry ice to 4 parts wet ice). Keeping your catch cool without excess moisture calls for dry ice. Packing your trophy fish or game in dry ice prior to transporting and shipping will ensure that it arrives in the best possible condition. To gain the full chilling effect and not damage your trophy, be sure to wrap your dry ice pieces in a towel or paper and don’t let the dry ice come in direct contact with your catch. Direct contact could cause freezer burn. Plan to pick up the dry ice as close to the time it is needed as possible. It sublimates at 10%, or 5-10 lbs every 24 hours, whichever is greater. Carry it in a well-insulated container such as a cooler. If it is transported inside a car or van without a cooler for more than 15 minutes, make sure there is fresh air to prevent carbon dioxide build up in the car. 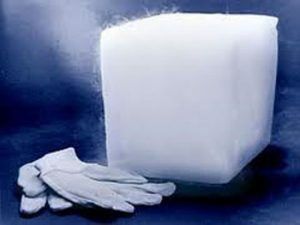 Dry ice temperature is extremely cold at -109.3* F (or -78.5* C.) Always handle dry ice with care and wear protective cloths or leather gloves whenever touching it. An oven mitt or towel will work fine too. If touched briefly, it is harmless, but prolonged contact of the skin will freeze cells and cause injury similar to a burn. Dry ice is frozen carbon dioxide (CO 2), a normal part of the Earths atmosphere. It is particular useful for freezing, and keeping things frozen because it is very cold. 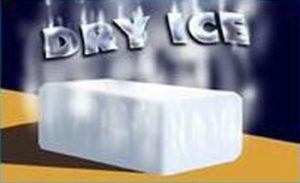 Dry ice changes directly from a solid to a gas (sublimation) in normal atmospheric conditions without going through a wet liquid stage (melting). Therefore, it gets the name “Dry Ice”. CAUTION: KEEP DRY ICE AWAY FROM CHILDREN IF THEY CAN NOT BE CLOSELY SUPERVISED AT ALL TIMES.